The Duke and Duchess of Sussex have arrived! Prince Harry and Meghan Markle (now officially Meghan Mountbatten-Windsor, or Meghan, Duchess of Sussex) made their first appearance as a married couple on Tuesday, three days after their nuptials at Windsor Castle. While the Queen ventured out for the Chelsea Flower Show, which is said to be one of her favorite events of the year, the couple has laid low the past couple of days, choosing to appear at a garden party honoring the patronage of Prince Charles, who is celebrating his 70th birthday in November. Like many moments of this royal wedding, the question must be posed: how does Harry and Meghan's first public appearance compare with William and Kate's? To start, Harry and Meghan chose to attend an event almost as big in size and scale as their wedding. Like the royal wedding, where 2,000+ guests included celebrities, royals, friends, family and those affected and impacted by the couple's charity work, this event will welcome over 6,000 guests–all from the various charities Prince Charles supports. Many of the attendees were first responders to the Manchester bombing last year, as the date marked one year since the tragedy. Will and Kate, on the other hand, chose an intimate meeting of four–and they were two of the four. In a super legendary meet-cute, William and Kate chose a private meeting with Barack and Michelle Obama (with a camera crew in tow) for their first royal appearance post-wedding. The Newlyweds, according to The Telegraph, greeted the Obamas in the 1844 room of Buckingham Palace. No television cameras or reporters were allowed in the room during the meeting, unlike the bevy of cameras and the paparazzi feeding frenzy Harry and Meghan were likely greeted with upon en route to and upon arrival at Prince Charles' event. 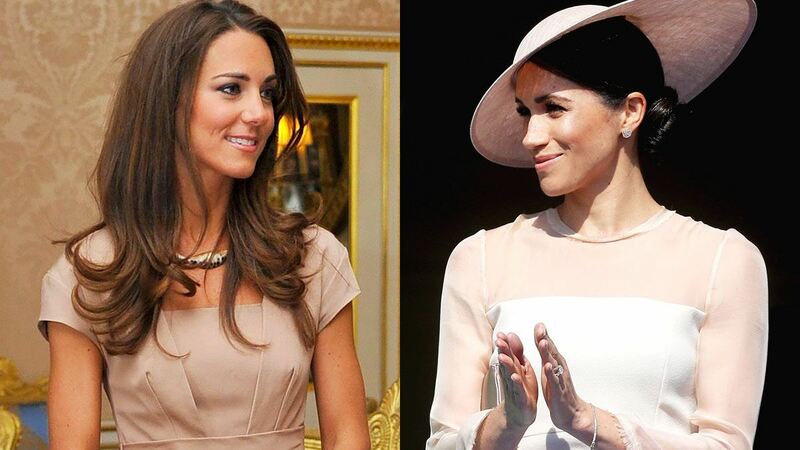 What's more alike, however, is how Kate and Meghan chose to dress for the occasion. Both royal wives opted for a pastel, which still feels relatively bridal, given that they were only days post-ceremony. And it seems that like Kate, the Duchess of Sussex isn't quite ready to hang up her bridal hat–literally. Meghan arrived in a blush pink day dress with an illusion neckline and ruffle-trimmed sleeves by British brand GOAT, along with a matching hat (likely designed by Stephen Jones, who created Doria Ragland's custom hat for the royal wedding). 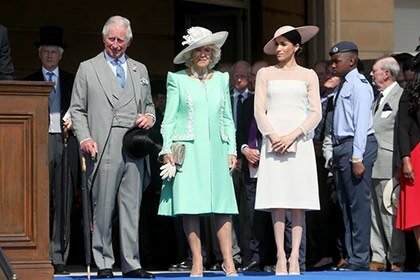 Unlike Meghan's many royal appearances prior to her wedding, the Duchess opted to wear hosiery for this event (which seems odd for early summer); Kate, who always tends to play by royal rules, chose to forgo stockings for her meeting with the Obamas. We can't help but be envious that William and Kate welcomed American royalty for their first official appearance, and given the Obamas' role as the first African American President and First Lady of the United States and Meghan's role as the first biracial, American-born Duchess, it almost feels as though the appearances should have been switched. However, considering that Prince Charles stepped in to walk Meghan down one half of her aisle to meet her now-husband at the altar, and then hosted the couple's evening reception at Frogmore House, it seemed only fitting that the couple would make their first public appearance as newlyweds in his honor, and at an event with a philanthropic bend, given their shared passion for charity work and social change. One other key difference? William and Kate went on their honeymoon before they delved into royal duties. Kate appeared tanned from her romantic vacation with William in the Seychelles when she greeted the Obamas. As for Harry and Meghan, the couple was noted to have delayed their honeymoon to attend to their first batch of royal duties; while their honeymoon destination remains a mystery, many have cited a luxury tented camp in Namibia as their chosen destination.